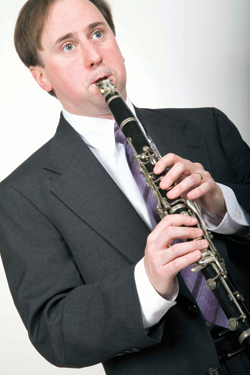 If it's a leap year, February gets an extra day--and Kenyon music lovers get an extra treat: Robert Milnikel, a member of the mathematics faculty as well as a talented clarinetist, presents his Quadrennial Leap Day Recital. The tradition goes back to 1992, when Milnikel's undergraduate senior recital, at Carleton College, happened to fall on February 29. He has offered a leap day recital ever since, often performing on bass clarinet and sometimes recorder in addition to clarinet. "I find that a few months of more concentrated practice every few years does wonders for my skill and stamina," says Milnikel, who plays (every year) in the Kenyon Symphonic Wind Ensemble as well as the Knox County Symphony. "More importantly," he adds, "I have few other opportunities to explore the vast solo and small-ensemble literature for clarinet. I've played solos, duets, trios, and one quartet in these recitals, and I've adapted music for flute, cello, bassoon, harpsichord, and a few other instruments. It's a great excuse to play music and work with people I wouldn't otherwise enounter." The 2008 program, held in the Brandi Recital Hall, included four works, among them an early composition by Leonard Bernstein and the challenging, four-movement Sonata for Clarinet and Piano in F Minor by Johannes Brahms. Accompanying him in the 2008 recital were pianist Ziyue Guo '10, cellist Kasey Kelly '10, and pianist David Lenkner '08. In his day job, Milnikel, an associate professor, teaches courses such as "Introduction to Programming," "Mathematical Logic," "Abstract Algebra," and "Theory of Computation." His research focuses on the mathematical analysis of logic as used in computer science.